Arts journal Afterall's film series Making Strange: Rooftop Sci-Fi at the Westin Bonaventure Hotel concluded this week with a screening of director John Coney's Space is the Place, a film featuring the music and philosophy of American composer/bandleader Sun Ra. With the Bonaventure hotel and the downtown LA skyline providing an appropriate backdrop to the film we were given an overview of Sun Ra's sound philosophy. Afterall's intention for the series was to present "low-fi cult features and artist videos that use elements of science fiction to cast new light on earthly struggles and everyday phenomena." Viewed in this light, Space...was an appropriate selection. It has always been tempting for some to minimize Sun Ra's contributions due to his emphasis on the extra-terrestrial, the costuming, and his early use of music technology. All of these elements of Ra's art come into play in the film and although it is indeed "lo-fi" in it's special effects it does provide Sun Ra (who co-wrote the film) an avenue to showcase his music, his spirituality, his ideas about the position of African Americans in American society, and his views on the music business and the media, by no means lo-fi content. However, it is music that occupies a central place in the film, with Ra frequently talking about his ideas about the transformative effects of his music and the film culminating in a concert. We also get to see footage of the Arkestra, most notably June Tyson, John Gilmore, and Marshall Allen. 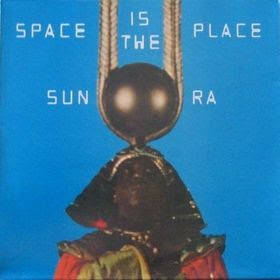 All in all, Space is the Place did in fact show Sun Ra's struggles to produce his art, although in a condensed cinematic form. As far as the everyday phenomena, these were indeed things that Sun Ra had to deal with every day. Yes, there were elements of caricature, yes there were elements of humor and absurdity, as in much art. But this should not make one take this film and Sun Ra's artistic output any less seriously.